The city of Kamurocho never sleeps, and for one fated Yakuza it continues to drag him back into the seedy underbelly he had hoped so much to leave behind. Yakuza 6: The Song of Life picks up immediately following the events that closed Yakuza 5, with protagonist Kazuma Kiryu and his former rival Masoto Aizawa laying collapsed after their final battle, and Kiryu’s adopted daughter and idol Haruka Sawamura announcing her retirement from the entertainment industry. It’s quite a narrative to be thrown suddenly into, but SEGA does a great job of slowly bringing you up to speed with all of the integral plot points you need to be familiar with, without making it overwhelming to newcomers. 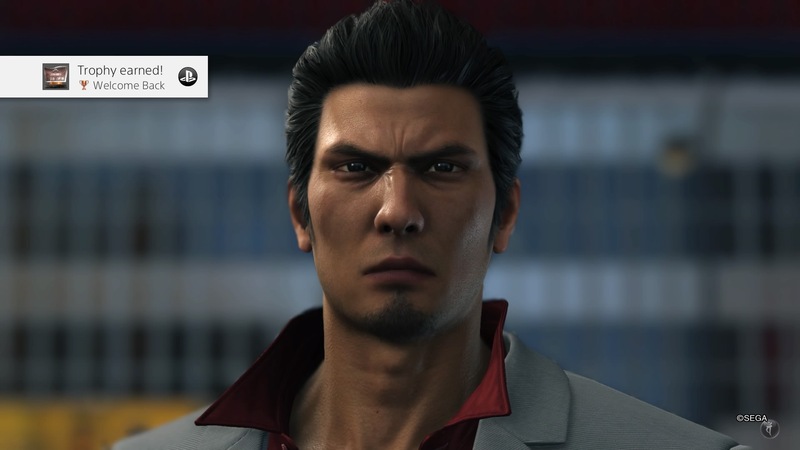 For the purpose of this review, I am going to not only stay out of spoiler-territory for Yakuza 6, but additionally do my best to avoid major spoilers relating to the events of the past games, apart from those which are unavoidable to set the introductory narrative to The Song of Life. Yakuza 6: The Song of Life is the type of game that just keeps getting better the more you play, as you unlock new features, new combat skills, and sink yourself deeper into the enthralling narrative it presents. The largest issue that games of this magnitude tend to suffer is pacing, but there was never any point during my 40+ hour playthrough that Yakuza 6 swayed from its devotion to my entertainment. Whether I was sitting back taking in an extended cutscene, or battling my way through the streets of Kamuocho, I enjoyed every minute thoroughly. After Haruka finds Kiryu bleeding in the snow from his wounds from his battle against Aizawa, she takes the Dragon of Dojima to the hospital only to be met by his other friends and leaders of the Tojo clan, including Majima, Saejima and police detective Date-san. Upon regaining consciousness, Kiryu determines that to clear his conscience and atone he must serve a three-year prison sentence instead of fighting against it, so that he can return burden-free to his peaceful life at the Morning Glory Orphanage with Haruka by his side. It’s an admirable move, but not one that is all-together surprising from the Dragon of Dojima. Things never go as planned for Kazuma Kiryu, and during his time incarcerated the city of Kamurocho and the lives of everyone that Kiryu surrounded himself with have changed. He returns to Morning Glory to his family, expecting to find Haruka, only to learn that she left the orphanage years earlier and has cut off contact with them. 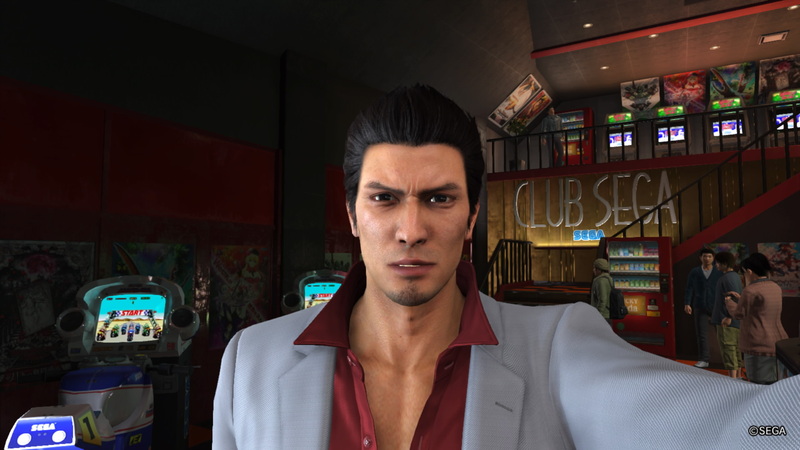 With nowhere else to turn and mounting concern rising over Haruka’s whereabouts, Kiryu returns to his old stomping grounds in Kamurocho in the hope that some old friends will have answers to his new problems. 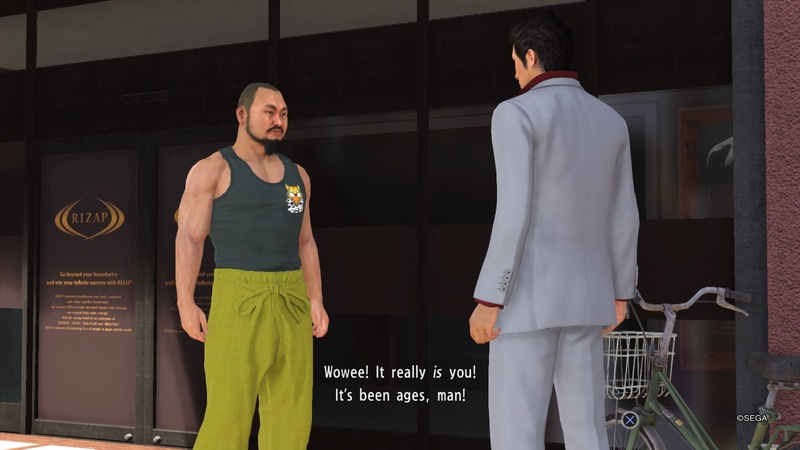 Kiryu’s release from prison brings about one unexpected event after another, and the personal narrative affecting series’ protagonist is set against the backdrop of an escalating war between two rival yakuza factions, Tojo Clan — of which Kiryu is former part of — and Omi Alliance, which culminated in the events of Yakuza 5. The power vacuum created from the destruction of the Omi — in addition to a combination of events that occurred while Kiryu was in prison, all of which I will leave to you to discover for yourself — have left openings for new and powerful factions to rise up, vying for a slice of Kamurocho. By this point in time — decades into the Yakuza narrative if we consider the events of Yakuza 0 — Kazuma Kiryu is known by almost everyone not just in the organized crime world, but Japan on the whole, as the Dragon of Dojima: a fabled yakuza legend. His decision to just step away from the life of a yakuza is not one that is taken lightly by his friends or enemies alike, and The Song of Life sees Kiryu’s boundaries constantly tested as he tries to maintain his civilian status. The only hurdle that newcomers to the series will have is getting through the first 2-3 hours of the game, which is comprised of 95% dialogue and cutscenes, both of which are absolutely necessary to set all of the context of the deep narrative. It can be a little daunting for those who aren’t used to this more classic Japanese art of storytelling, but once the game drops you into the neon-lit streets of Kamurocho, the real Yakuza fun begins. 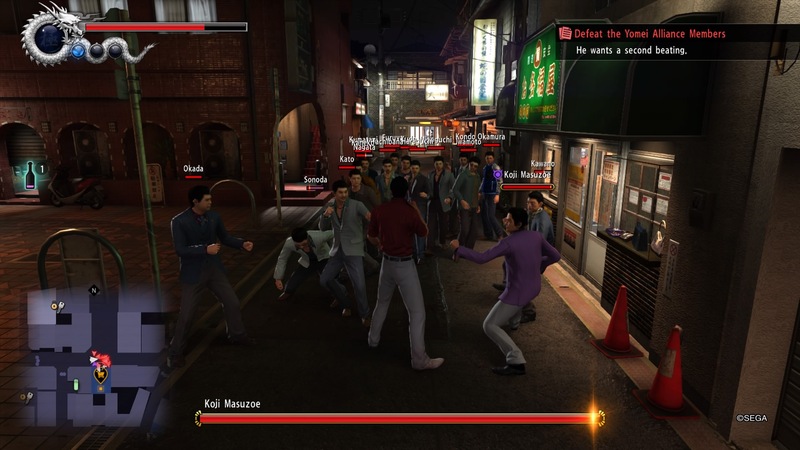 Gameplay in the Yakuza series is almost as varied and far-reaching as the narrative is, with the core game being comprised largely of street-brawling, interspersed with a plethora of different mini-games, Sub Stories, and other activities to distract yourself from your more pressing mission of finding Haruka. There are so many things to do in Yakuza 6, and in Kamurocho specifically, that it’s possible to get wholly distracted right from the get-go, wandering into any of the number of open buildings which house arcades, restaurants, and side narratives awaiting the right passerby. You’ll run into a lot of familiar faces along the way; in fact, a majority of characters from the previous games make an appearance throughout The Song of Life, although, often in completely unexpected ways. Veterans of the Yakuza series will be right at home with the appearance of characters dating back to Kiryu’s earliest days on the streets of Kamurocho, but the developers do a great job making sure that instances of deja vu aren’t lost upon new players. While experienced players will catch the more subtle nods to previous iterations in the series, characters are always introduced in a way that is accessible to newcomers to the series. 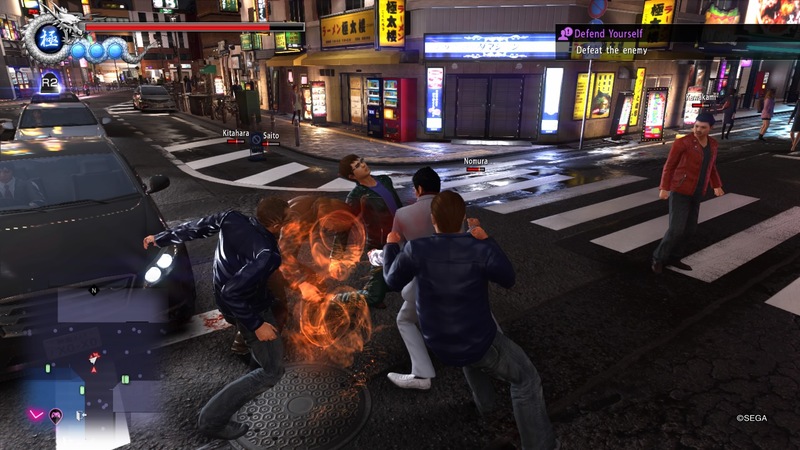 The crux of Yakuza resolves around fighting though, and you won’t survive long on the streets without spending some time perfecting your combat skills; at least if you want to have any impact against the rising tide of undesirables who have made Kamurocho and Onomichi their home. 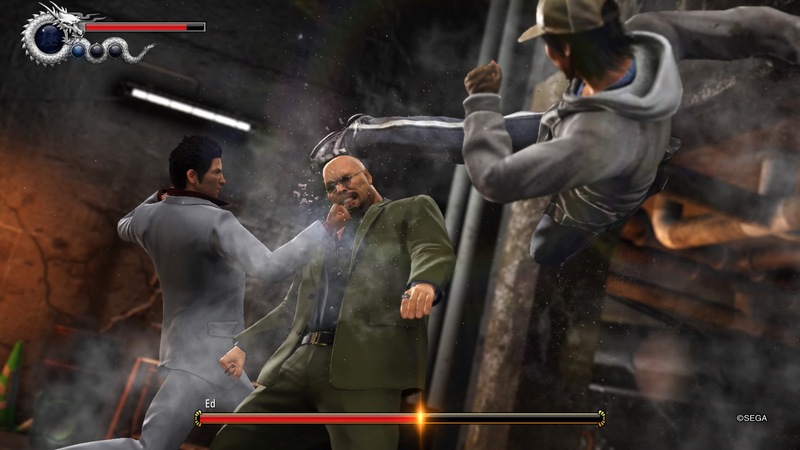 While basic combat in Yakuza consists of a relatively simple light/heavy attack, block, grab and dodge system that has remained largely unchanged throughout the series, being successful in combat requires a deeper mastery of Battle Skills, proper use of the Heat Gauge and Heat Actions, and lightning-fast reflexes. 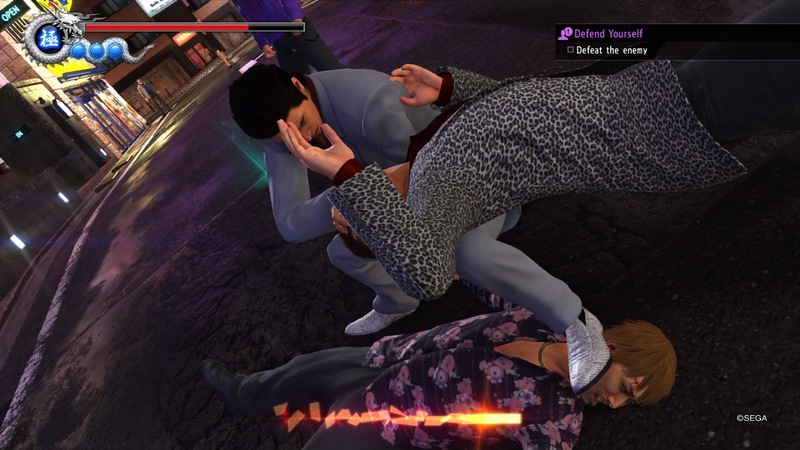 Combat is no cakewalk in Yakuza 6, and even on normal difficulty you’ll find yourself up against some extremely tough enemies, often flanked by mobs of regular goons that you have to take care of simultaneously. In these scenarios situation control is absolutely vital, which is where your Battle Skills and Heat Actions come into play. Battle Skills give you new complimentary moves to the core mechanics, such as the ability to parry attacks, strike while evading, or perform a diving attack. These skills also include passive modifiers, including the integral ability to speed up your combos so you can land strikes in quicker succession. Heat Actions on the other hand are special moves that become available as your Heat Gauge increases. You can increase this gauge through a multitude of ways during battle — such as landing strikes and blocking attacks — as well as through the use of items. The Stats menu lets you unlike a variety of Heat Actions, and they’re easily the best combat moves in the game. Not only do they causing devastating damage and allow you to perform some serious crowd control, but every Heat Action comes complete with a high-octane cinematic which is the highlight of every battle. If you want to bring a little more pain, you can pull the Right Trigger to enter Extreme Heat Mode and quite literally pummel your foes into submission with a flurry of blows that would make Ip Man proud. Combos that you land during this mode, aptly named Heat Rush combos, end with a small Quick Time Event which lets you stack some additional damage alongside one of those delightfully savage cinematics. Combat is everywhere in Yakuza 6, and it is extremely satisfying. A majority of the missions has some sort of fighting element to it, and I’ve yet to tire of it even after 40+ hours. The beauty behind Yakuza 6‘s refinement of their tried-and-tested combat systems lays in this juxtaposition between simple controls and complex contextual possibilities. Fighting against a group of enemies differs greatly from fighting against a solo opponent, and you can tackle any situation in a variety of ways depending on how you’ve progressed your Battle Skills or Heat Actions. While I spent a large portion of the game absorbing damage and focusing on my footwork, unlocking multiple Parry upgrades (which combine with those beautiful cinematic takedowns) quickly turned it into my method of choice, especially when surrounded by upwards of 15 enemies. Depending on what activities you partake in, you gain experience towards one of five pools — Strength, Agility, Spirit, Technique, and Charm — which can then be allocated towards any of your base stats: Health, Attack, Defense, Evasion, and Heat Gauge. 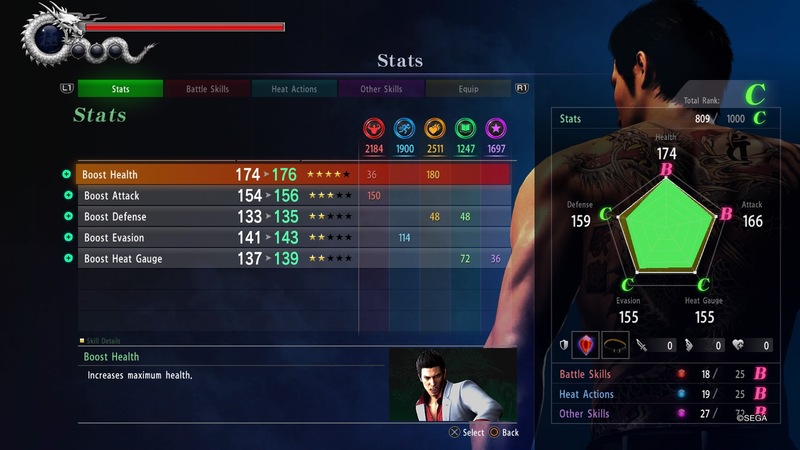 In addition to this Kiryu can also learn Battle Skills to assist in his combat versatility, Heat Actions which allow him to unleash devastating attacks when the Heat Gauge is full, and Other Skills which passively assist that player throughout the game. These includes things like experience gain boosts, social skills, and even alcohol tolerance. In addition to your core stats, Kiryu comes across all manner of Equipment during his travels — funnily enough mostly a variety of belts and the occasional bobble — which give boosts to your stats or provide resistances against different types of weapons. As mentioned, Kamurocho can be a little overwhelming to newcomers, just because of the impressive amount of activities and content contained within. One of the first things you’ll notice wandering the streets are the various restaurants and fast food joints, beckoning you to come inside with their colorful advertisements. 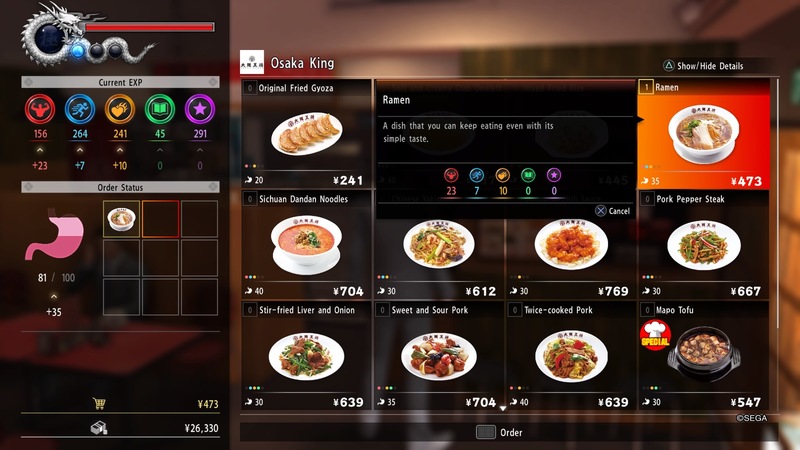 Eating is more than just a luxury in Yakuza 6, and veterans of the series will be delighted to see the improvements that have been made to the dining system in The Song of Life. Aside from the sheer fact that it’s fun to travel around and sample all of the different tastes in Kamurocho and Onomichi — which includes the variety of options which one would expect to see in both urban and rural Japan — food grants Kiryu experiences points in one of the five stats, and provides a small health or Heat bonus. You can upgrade your ‘Digestion’ through the Stats menu, which allows you to digest food even quicker and stomach more, so that you can keep going back for more experience! 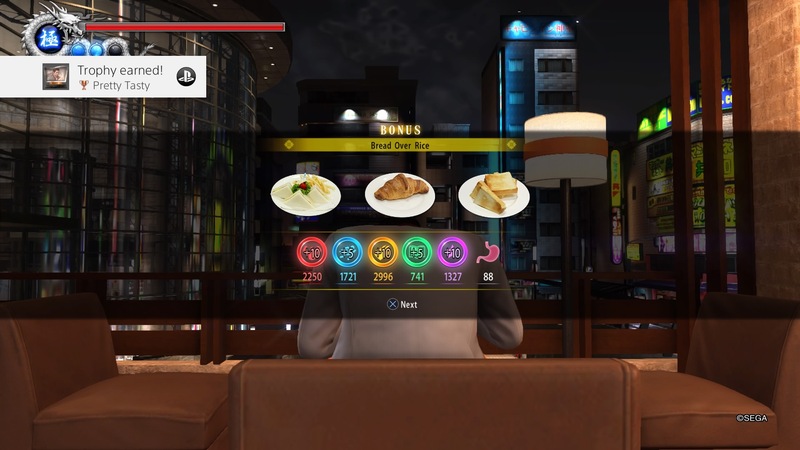 While this can get pretty expensive at the beginning of the game, as I progressed and found my pockets increasingly lined with disposable yen, food became one of my biggest sources of experience and I made it my goal to sample everything the two cities had to offer. It helps that eating everything on a restaurant’s menu give you bonus experience, and that certain quest-lines entice you to focus on certain foods over others. If you can tear yourself away from the delectable platters offered by Japanese chefs, you’ll find that the city has quite a lot going on in it. You can enjoy some pleasurable — and informative — company at one of the cabaret clubs or the internet cafe, or head over to a bar if you’re feeling like some social time. Vending machines line every street and alleyway, and offer up dozens of products that give small boosts to your next fight, and you’ll even stumble across keys scattered throughout the two cities which unlock special safes containing money and equipment. It’s the combination of all of these little things that make the cities of Yakuza feel so alive, whether it’s the lively neon streets of Kamurocho, or the series’ newest locale: Onomichi. 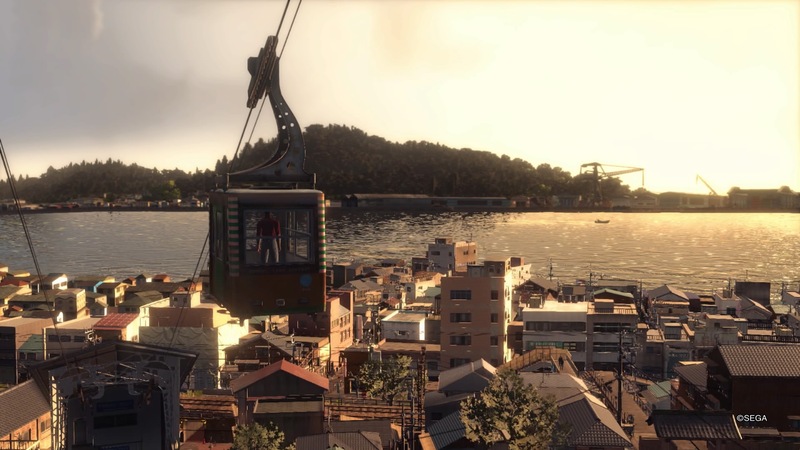 Following suit from previous entries in the series, Yakuza 6 introduces us to a new locale with the seemingly quiet fishing and shipbuilding town on Onomichi, in the province of Hiroshima. Quite the juxtaposition from the bright lights and debauchery of Kamurocho, Onomichi has much more lurking underneath than is apparent when Kiryu arrives on his search for Haruka, following a trail of breadcrumbs that never seems to end. The streets of Onomichi may not be as vibrant as Kamurocho’s, but there are still some fun side activities to partake in, mostly entertainingly the Spearfishing minigame, which could almost be a game in its own right. The time spent in Onomichi is a lot more narrative driven though, as Kiryu’s entire purpose in the town is driven by his quest for answers about Haruka. It’s important to note — especially for series newcomers — that while Yakuza 6 is indeed an open-world and free roaming game, the narrative constricts you to one city or the other. Yakuza isn’t the typical “open-world” that many who hear that description expect. Even though they vary greatly in size, Tokyo’s Kamurocho and Hiroshima’s Onomichi are both excellently designed cities, with a wealth of activities contained within them. You can spend hours losing yourself in the restaurants, shops, and hidden corners of each locale, although admittedly you will spend a lot more of your time under Kamurocho’s neon lights. The cities are connected both physically and metaphorically in unique and interesting ways, that I will leave for you to discover on your own. Discovery is one of the many joys in Yakuza 6, and you never know what awaits you through a door or at the end of an alleyway. 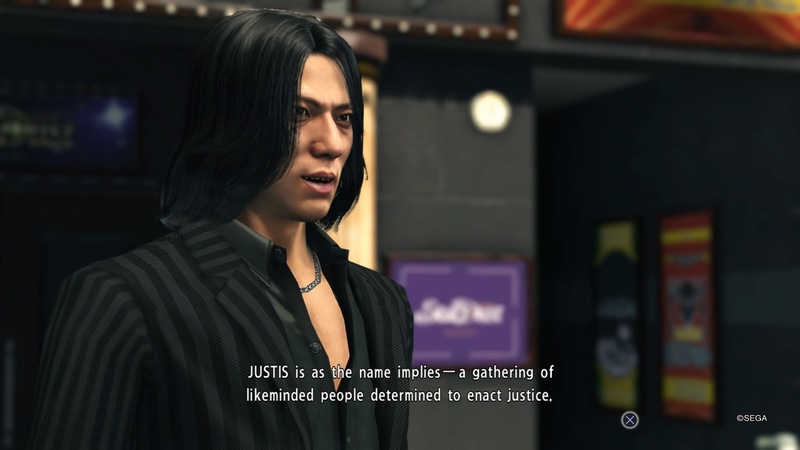 The chaos caused by the tensions between the Tojo Clan and the Omi Alliance in Yakuza 5 has created an opportunity for smaller groups to move into Onomichi as well, including the all-too-familiar Jingweon Mafia — who are still holding some grudges after the events of Yakuza 2 — and a mysterious new organization named JUSTIS. 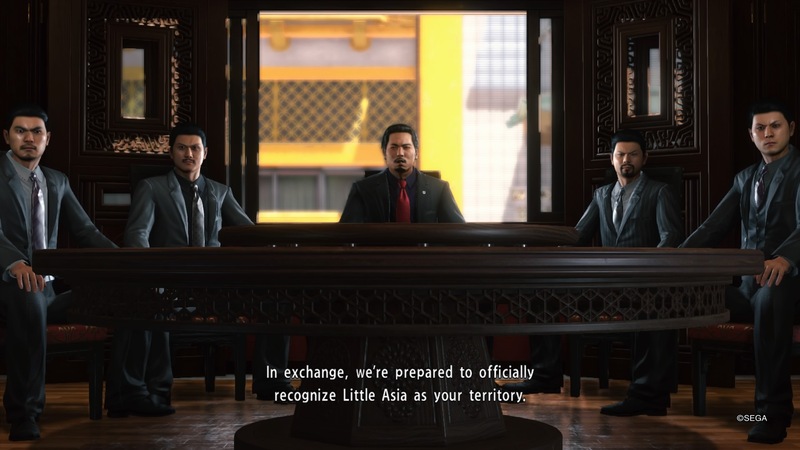 In the several years since Kiryu was incarcerated, other Yakuza families have also risen to prominence in the region, most notably the Yomei Alliance, and threaten the delicate balance of power that weighs the fate of Kamurocho and Onomichi alike. There are a lot of groups, people, and general history to keep track of in Yakuza 6, but the game does a wonderful job of balancing a narrative that has many references to past events and characters, without becoming too overwhelming to newcomers to the series. While some background knowledge of the events of past games is definitely useful to fully understand the complexities of The Song of Life‘s narrative, SEGA has made all of this information accessible from the main menu through a ‘Memories’ section that gives a succinct summary of the previous 6 games. In addition to this, you can also replay any of the major story cutscenes from the main menu, if you ever need a refresher before diving back in. 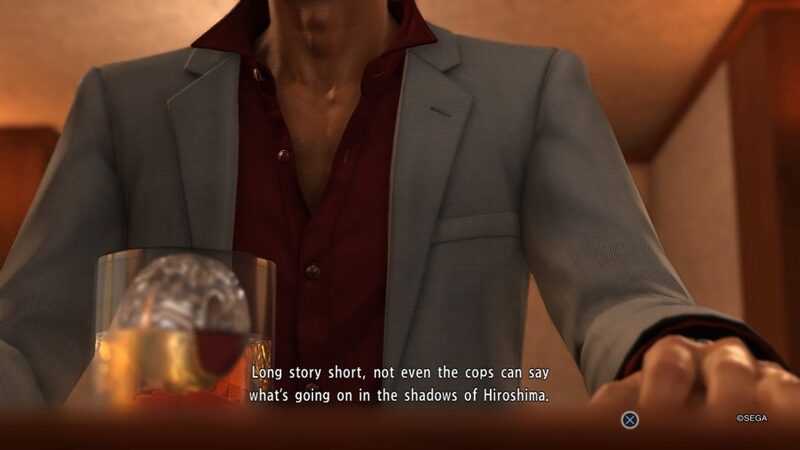 In addition to that, for a narrative that is seven games deep it never falls short of its intended mark, you continue to feel for Kiryu’s plight through the entire story, wanting to see it through as much as he does. The developers have done a great job connecting the strands stemming from the plethora of story-lines contained within the aforementioned games, with both characters and plots from past narratives intersecting in new and often unexpected ways. Enter the classic Yakuza Sub Story. 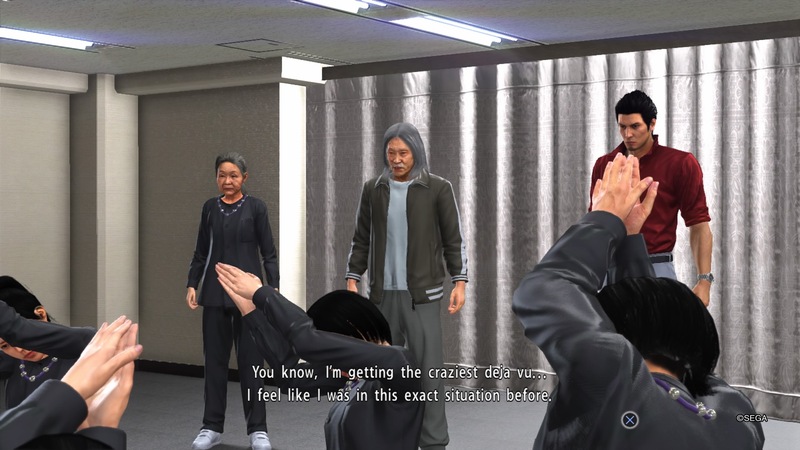 The Yakuza series has always put an exceptional amount of work into their side missions and mini-games, introducing quirky new side characters and entertaining stories bound to keep you distracted from your main mission. The Song of Life has taken that attention to detail to an entirely new level, fleshing out the Sub Stories to include a host of new gameplay features, returning characters, and activities that form a core part of Yakuza 6‘s offering. You’d be remiss not to take every single opportunity that you stumble across, as Sub Stories contain some of the most heartwarming and farcical moments in The Song of Life. The best part about Sub Stories is that they all occur organically as you’re traveling through the city, and they function as compartmentalized adventures that Kiryu can choose to partake in. 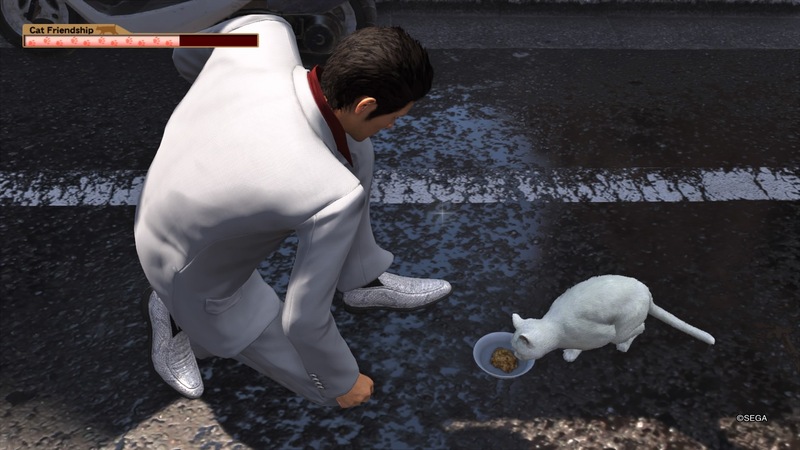 Some of the Sub Stories are serious, whereas other — such as assisting a Cat Cafe owner in rescuing stray felines — are ridiculous and just wonderfully Yakuza. Some stories also feature some returning faces, like Pocket Circuit Fighter, or the cult of Munan Chohept Onast, which gave both Kiryu and I some serious deja vu. The core reason you don’t want to skip these seemingly innocuous stories is that they often form large portions of Yakuza 6‘s gameplay. A perfect example of the detail is the “We’re Committed to Results” Sub Story which follows Kiryu’s foray into the world of bodybuilding. After deciding to join the new RIZAP gym thanks to some unsolicited advice, Kiryu is put through a regiment of bodybuilding mini-games and then tasked to maintain a strict diet by following clues to eat certain dishes at specific restaurants. It’s a Sub Story that simultaneously gives you narrative, increases your stats through the workout, and forces you to explore the different types of food offered by the variety of restaurants. It’s this attention to detail that exists in every facet of Yakuza 6, connecting every single piece of the world and narrative to another, leaving no string unattached. For an even closer ear to the heartbeat of the city, the newly integrated Troublr App keeps Kiryu connected to crimes as they happen, with the ability to respond to these crimes within a certain amount of time, occasionally leading to some unforeseen surprises. You’ll fail these missions if you take on any Sub Story or Main missions though, but from what I can tell they seem to pop back up against after some time. 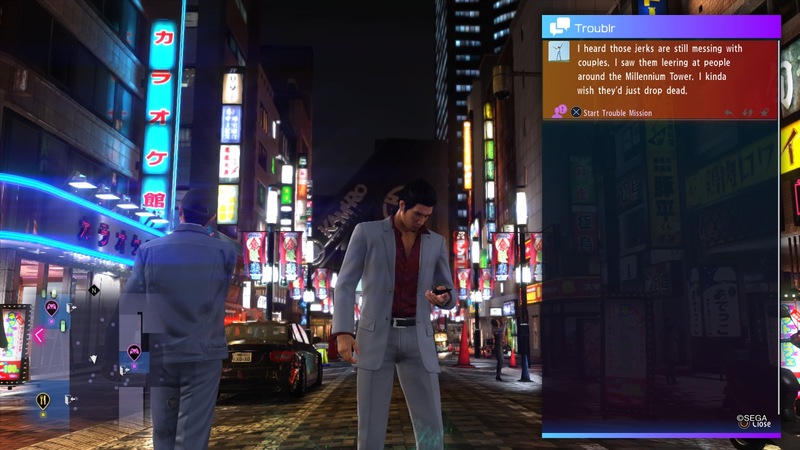 If the engrossing main story, wealth of Sub Stories, restaurants and the Troublr App weren’t enough to keep you entertained, Yakuza 6 has a number of mini-games that can keep you entertained for hours. Classics like Darts, Mahjong, and the Batting Cages make their return, in addition to some full games like Virtua Fighter 5 and the Tetris-esque competitive puzzle game Puyo-Puyo. This is in addition to a number of other SEGA inspired games that can be found in the Arcade, to which I have already lost many hours without realizing how engrossed I’d become in the games within Yakuza 6. Perhaps one of the best features surrounding the mini-games is that you can play several of them competitively online, right from the Main Menu! The amount of work just put in to all of the distractions in Yakuza 6 is astounding, and it’s all of the attention to detail in everything from the atmosphere and environmental set pieces to the distractions that makes the game as engrossing as it is. I can recall pondering as I first loaded up The Song of Life how SEGA was ever going to top the liveliness of the world in Yakuza 0, and I can say without a doubt they outdid themselves. Perhaps the largest new addition to Yakuza 6: The Song of Life is the inclusion of Clan Creator battles, which don’t come into play until you’re progressed substantially through the storyline. 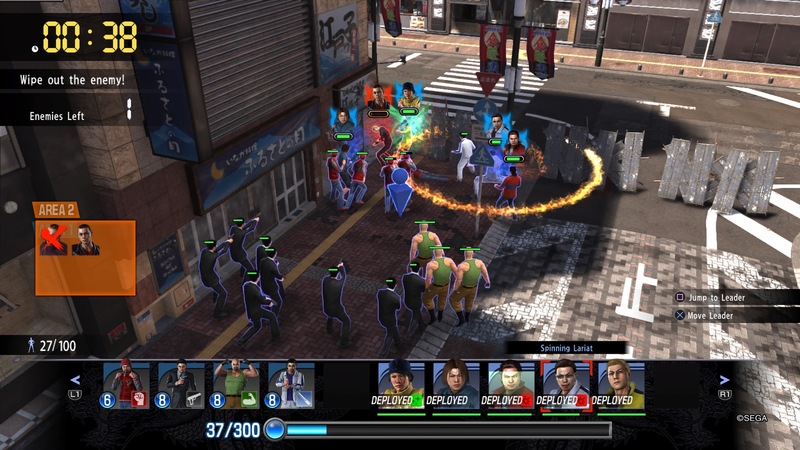 Clan Creator allows you to build up your own group of fighters, and send them on missions against rival factions (including in online versus mode) in a sort of Yakuza tower defense-esque mini-game. I’m hesitant to even call it a mini-game, because the amount of depth in Clan Creator is something to be heralded. After you unlock the feature, you can find potential new clan members roaming the streets of Kamurocho and Onomichi, in addition to gaining them from completing certain missions and Sub Stories. You can then group your Clan into Strike Teams, and even level up individual members using Kiryu’s experience. It’s a well thought-out addition for a mini-game, but at this point that should come as no surprise to anyone. Yakuza 6: The Song of Life is a story of loose ends and plot twists. Seemingly minuscule actors and aspects of the storyline can become integral plot points, and at points you’ll be sitting with your controller in hand, and your mouth agape, trying to piece together what just happened. It’s not the type of narrative that drags you along for a ride though; you’re holding onto your seat every minute of the story, expertly woven by a team that has becomes masters in their craft. There is so much contained within Yakuza 6 that even as I come to a close here I’m certain there are things that I haven’t had time to go into enough detail about. Once you’ve taken in everything there is to digest in The Song of Life you can restart your adventure in Premium Adventure Mode. 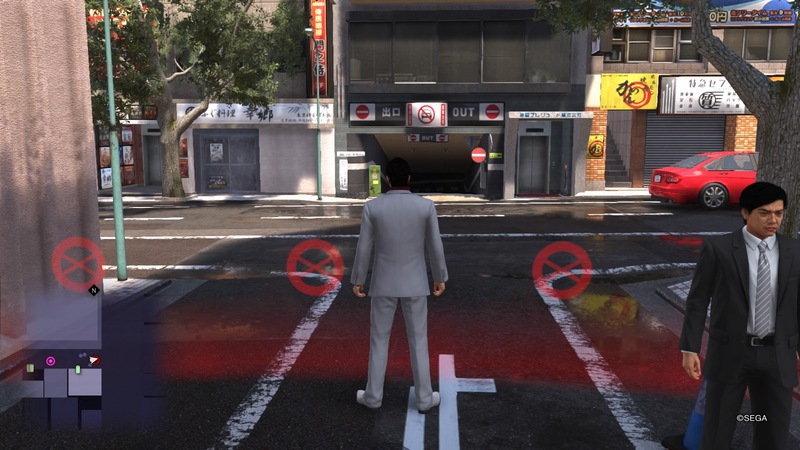 Similar to a ‘New Game +’, Premium Adventure mode does not let you carry over experience, but allows you to play around with game features like the day/night cycle, and includes the ability to change Kiryu’s clothing. Yakuza 6: The Song of Life is the complete action-adventure package. Even with the plethora of narrative behind it and the at times almost overwhelming amount of things to do in Yakuza 6, the game never falters in its pacing or trips over itself. It’s presented in a way that makes it easily accessible and immediately consumable; whether in bite-sized segments or strapped in for the long haul when the narrative becomes too enthralling to put down. The Dragon of Dojima has made a lot of enemies and friends during his time spent as a Yakuza in Kamurocho, and SEGA has done a brilliant job in bringing everything and everyone home to roost in what may be the best Yakuza game that has been released to date. 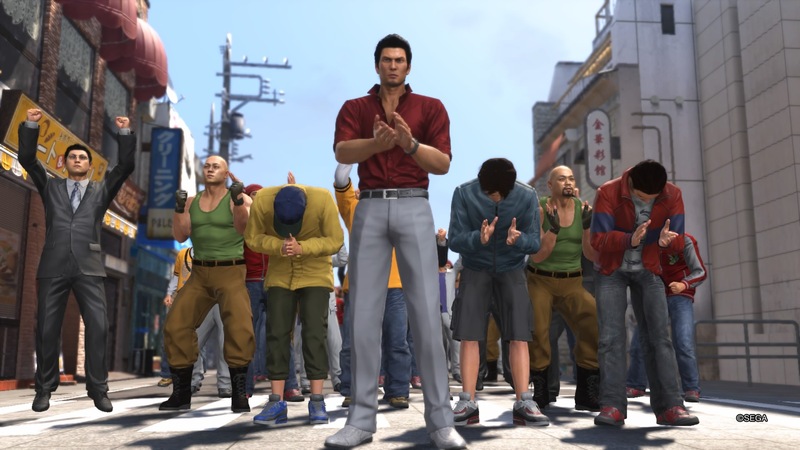 While Yakuza 6: The Song of Life may bring one chapter of the series’ extended epic to a close, it has opened up the world of Yakuza in a way that I hope will allow a whole new generation of fans to become captivated by its intricacies. Yakuza 6: The Song of Life isn’t just everything I want in a Yakuza game; it’s everything I want in any action-adventure game. A wonderful juxtaposition of simplicity and refinement, that’s as inviting to newcomers as it is invigorating for veterans.